This past weekend was the FANFARE Regatta at our local Nepean Sailing Club. Classes were 505, Albacore, Fireballs, and Open Catamaran, which meant I could sail with my wings in place on the SX18. Saturday, a cool but sunny day, had NW winds which were very fluky, with 5 -8 knots accompanied by gusts of up to 18 knots together with a 35 degree wind shift. By the end of the first race, I knew that my new crew would be able to cope, and we soldiered on as the wind (and the gusts) began to pick up. So here is what happened - On the 2nd upwind leg in the 4th race, port tack, both of us out on the wing, and we are catching up to the Tornado. I cleated the main so I could shift my weight a touch forward, and as I was leaning in to uncleat the mainsheet, BAM, we get hit by both a gust and a wind shift. I tried to uncleat (unsuccessfully), and as I turned the H18SX into the wind, she corkscrewed, and I realized there was a problem. The starboard wing hit the water, and we could not save the situation without further forward momentum, and the slow capsize began. No one was hurt, so all is good, other than my pride. Tell the crew to stay with the boat, furl the jib, release the main traveler and mainsheet, grab the righting line, and with some help from the Mark Set boat, the mast comes up. As both hulls are now in the water, I grab the dolphin striker, and the boat starts sailing away fast, really fast, leaving the crew behind. How to get on board? Hanging onto the dolphin striker for dear life, I found that the pressure of the water on my legs was preventing me from raising myself up onto the hulls or the tramp. Yikes, what now? I made the decision to drift under the tramp (glug glug) and grabbed the rear cross bar, then put a hand on the tiller bar so I could turn the H18SX into the wind. Whew! She stopped, I climbed on board, tidied up the sheets, and went to rescue the crew. Dang, DNF. 4th place, so no free beer. Besides the suggestion of losing weight or going the gym more often, has this 'pressure of water' problem happened to others, and how did you solve it? In retrospect, what I did was potentially very dangerous, which is why I am posting. What else can cat sailors do after a capsize? Impossible to get up with the boat moving like that. Not easy for anyone! You should have... never let go of the boat. You could hold the righting line and drift aft or "walk" your way aft using the center lacings of the trampoline. That's exactly why I am posting this thread, Matt, thank you for your very prompt response. In fact, to be technically correct, I never let go, but 'walked' my hands down the centre lacing lines. I like the idea of using the righting line as a 'safety line', that would have been much safer. My buddy Kieran, who crews for Joaquin on his F18, had the same thing happen when they capsized two weeks ago. Kieran at 24 is in really good shape, and managed to wiggle one leg over the hull in front of the cross bar. This is part of the reason why it's important to have the bows pointed into (or nearly into) the wind when righting. Some also recommend deploying an anchor or sea anchor off the bow before pulling the boat up. I think either moving yourself down to the leeward side of the boat to intentionally capsize it or walking your way back to the rudder and turning the boat into the wind were really your only two options. When deployed to right the boat my righting line runs from the front crossbar to the rear crossbar, hanging down and around the outside of raised hull. Once the boat is righted I pull my way up to the front crossbar on the upwind side of the boat. This involves swiming/pulling yourself under the hull. Once there I climb aboard as quickly as I can. The advantage of this method is that it positions you such that your drag tends to point the boat into the wind as you climb aboard. A slower but still effective alternative is to head to the rear crossbar and turn the rudders, as you did, or drag off the upwind side of the rear crossbar until the boat is in irons. Wow, not good to have the boat take off on you like that! I've (thankfully) never had the boat try to run away on me. I'm surprised it did that even with the mainsheet and traveller uncleated. I think srm is right, bows need to be pointed into the wind, and I'll definitely be paying more attention to that next time I right the boat! Getting back aboard while underway is very challenging. My crew and I were fooling around at one point dragging alongside the boat, and even at 6-8mph, it was a big challenge pulling yourself aboard. I became exhausted quickly, and struggled to get back on even once we were head to wind! It's funny, I've always heard that you need to have the wind 45 degrees off your bows, but the reason for it that I always heard/understood was to use the wind pressure on the trampoline to help right the boat. Also, at that angle, the wind helps to break the contact of the mainsail with the water to help the boat come up. Now it seems like it's fairly critical in terms of safety to have the bows pointed towards the wind for righting! Joe's idea may work as well with a runaway boat, moving to the windward side of the crossbar to create drag/turning force to make the boat head up into irons. Steve, you are absolutely correct about pointing (as much as possible) into the wind, when recovering from a capsize. That's where we started, at about 45 degrees. When the Mark Set boat came to help, they had challenges reaching down to raise the tip of the mast out of the water. which meant we drifted to about 90 degrees to the wind, and once the H18SX came up, off we went! Also, I actually have two righting lines, one thick +/- 1" tied to the dolphin striker, which doubles as a painter, and another of 7/16ths which runs under the tramp using pulleys and a bungee. Looks like a capital M or W. That was one of my 'safety lines' as I gurgled under the tramp. 1) it is really tough to pull yourself up from a boat moving quickly through the water. no fault there. 2) sounds as if you did everything right to recover from that mate. Thanks for sharing your experience! I haven't (yet) have that happen to me, and your recovery from it is something I'll remember. Work my way aft either with righting line or tramp lacings, turn upwind with rudders. My Tornado neighbour and former H16 sailor read this post, and said that years ago, a similar thing happened to him. He warned me that anytime the tiller extension is left to drag behind the boat (especially after a capsize), the rudders will 'hold' the boat's course. Interesting. I thought that dragging the tiller would cause the boat to head up into the wind? My understanding was that, at least when in irons, throwing the tiller extension into the water keeps the boat pointing into the wind. John, Thanks for the free autohelm tip. I will have to try this some time. I find this to be pretty unlikely. The tiller extension dragging behind the boat will cause just that - drag, but I don't see it having any significant impact on the helm or whether the boat does or does not round up. If your boat is set up with a light helm, then it may take a while for it to want to round up. 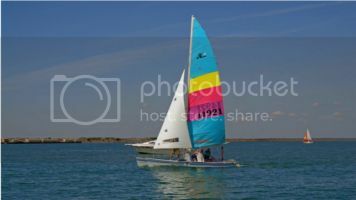 If the jib is left sheeted in and the main is released, then you may not end up with any weather helm, plus the resistance from a person dragging below the boat may also prevent the boat from wanting to turn on its own. In any case, I don't see how you could prevent the tiller from dragging behind the boat after righting. I've never tried this and don't know how feasible it would actually be, but one thought would be to kick the rudders up completely prior to righting the boat. With the rudders up and the sails released, the boat would almost certainly want to round up immediately after righting. One other note, I would definitely avoid allowing the tiller extension to "dangle" behind the boat when sitting in irons. When the boat starts drifting backwards, it can put a lot of load on the tiller extension and tiller crossbar. My son grumbled at me, and reminded me to think about the effects of 'centre of lateral resistance' vs 'centre of effort'. We even discussed whether or not I should have unpinned the clew of the main sail, and possibly left the jib half furled. SRM's main point is that it is better to be at least 45 degrees to the wind to avoid these adventures. But then we would not have a whole lot of interesting debates. yeah, I guess that wouldn't work so well. It is probably fair to say that anything that isn't influenced by your heading (GPS or compass) or apparent wind can't possibly allow the boat to hold a course. As far as only partially furling the jib, I am not sure how that would have helped. Shifting the center of effort aft (by removing the jib) increases weatherhelm, making your boat want to turn into the wind.